Investigate one of the factors effecting current flowing through a wire. Aim - To investigate one of the factors effecting current flowing through a wire. Length – The length of a wire affects the resistance. The longer the wire is, the higher the resistance, and so the current in the wire is lower. This is because in a longer piece of wire there are more particles. It is harder to pass current through many particles than it is just a few. Diameter – As diameter increases, current increases. To explain this I will use the model of people going through a door. If the door is small, it will take people a long time to get through it. If the doorway is large, it will take the same amount of people a much shorter time to get through. This is the same as electrons moving through a wire. Temperature – When temperature is high, resistance is high. This means current is low. This is because when the wire heats up, the particles start to vibrate quicker. The vibrating particles restrict the flow of electrons, reducing the current. Voltage – Ohms Law states that when voltage increases, current will increase proportionally if the temperature is constant. This is because voltage is the push of electrons through a circuit. If the electrons have a bigger push, it is easier for them to travel through the circuit. This is why current increases. Resistance – Wires with a higher resistance will have a lower current flowing through them. This is because wires made of a resistant material restrict the electron flow through them. Wires with a low resistance are good at letting electrons flow through them. 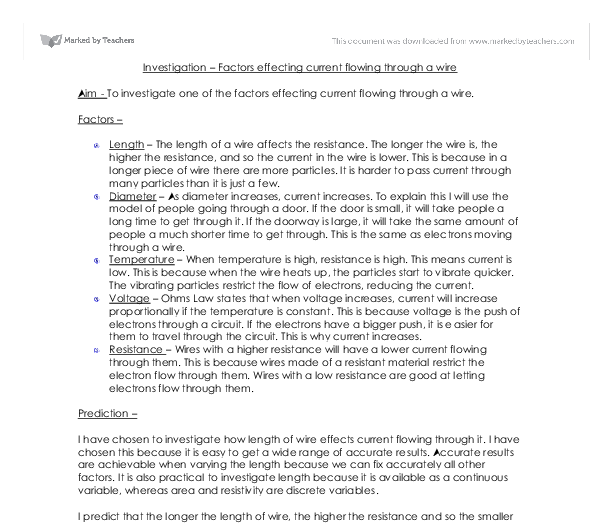 I have chosen to investigate how length of wire effects current flowing through it. I have chosen this because it is easy to get a wide range of accurate results. Accurate results are achievable when varying the length because we can fix accurately all other factors. It is also practical to investigate length because it is available as a continuous variable, whereas area and resistivity are discrete variables. 1. There must be a potential (voltage) difference across the wire. 2. The electrons must be in the conduction band. Electrons are given energy by the voltage provider (in our case a 2V power pack), which propels them into the conduction band. However, there are still small atoms in the way of the electron, and electrons don’t move from side to side to avoid obstacles. Every time an electron hits an obstacle it slows down and gives off some energy, thus the flow of current is reduced and the wire becomes slightly warmer. The power pack must not be used for producing currents of more than 1A, and so our experiment will need to incorporate a variable resistor. This means that we can control the voltage across the wire and so get an equation for resistance R = V / I . 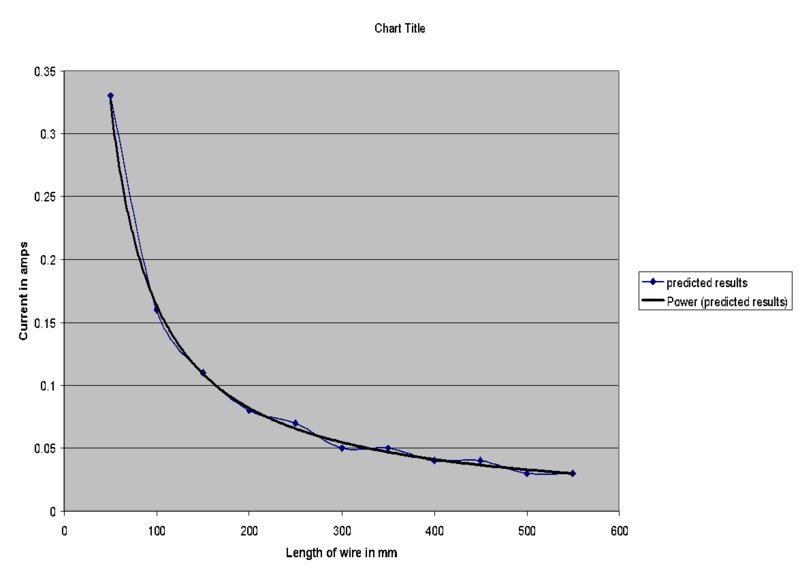 As we have known values for voltage, area, resistivity, and length, I can calculate predicted results, and draw a predicted graph. I repeated this with every length of wire I plan to test, and have calculated the following predicted results. Measure width of wire using screw gauge micrometer.Begin with an experiment wire of 50mm.Adjust the variable resistor so that the voltage in the circuit is 0.2V. (measured on voltmeter)Record the current in the results table.Turn the experiment off.Increase the gap between the crocodile clips to 100mmReset the voltage to 0.2V using the variable resistor. Record the current in the results table. Continue using this method until you have recorded experiment wire lengths every 50mm between 50-600mm.Repeat the experiment 3 times. I will make the experiment safe by using a low voltage. I will turn off the experiment when changing the distance between the crocodile clips. I will not leave the experiment running for too long, as the wire will get hot and burn the table. I will keep the experiment away from water. I have used a variable resistor to ensure that the current does not exceed 1amp. This will prevent short circuits. I have kept the experiment fair I will control all factors, with the exception of length. I will keep the voltage in the current constant by adjusting the variable resistor. I will use the same piece of wire each time, this ensures that the type of wire, and diameter is the same. I will turn off the circuit between readings. Anomalies occurred in my collected results. At a length of 100mm the current was higher than expected. This means that the resistance had decreased. The factor that changed this resistance was room temperature. The room must have been slightly colder when this reading was taken. This also occurred at a length of 500mm. At a length of 200mm, the current was lower than I expected. This means that resistance must have increased. Temperature increase is a factor that makes resistance increase. This result could be from the experiment being left running too long. The temperature of the wire would have increased, increasing resistance and reducing current. My predicted results for current were all slightly lower than my collected results. This means that the resistance must have been lower than I calculated for my predicted results. The factor that effected resistance was room temperature. In my predicted results, the value for resisitivity of nichrome I used was for a room temperature of 20°c, whereas the room temperature when I carried out the experiment was about 18°c. At a lower temperature, the resisitivity of nichrome was lower. This would explain why my collected results all have a higher current than I expected. If I were to extend the investigation into 'factors effecting current flowing through a wire' I would investigate another factor. Possibilities are diameter, temperature, voltage, and resistance. 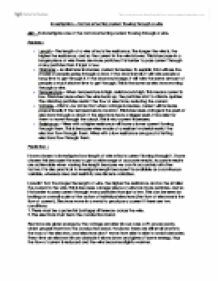 several places, to reduce the chance of there being unnoticed discrepancies in its width. Using the same wire for each length will also ensure that ? remains constant as well. Implementing Precision of readings The voltmeter and ammeter measure to the nearest 0.005, hence all values for voltage and current are recorded to two decimal places. I am going to conduct six repeats, using the power supply's built in electromotive force variables, from 3 to 12 in steps of 1.5. I am going to record, the electromotive force, and the voltage across the bulb, the current around the circuit and the resistance in the bulb. I have concluded that the amount of resistance in a circuit affects the flow of current through a circuit. My Results Table and graph prove this. I have also proved Ohm's law correct, that when current and voltage are altered at room temperature the resistance changes proportionally. The resistance is directly proportional to the distance. Resistance (ohms) Length (m) PRELIMINARY TESTING Before starting the testing on my final experiment I created a small preliminary test to quickly test for trends/accuracies or potential problems that could occur. It would be easier to solve them before starting the main experiment. and some of the points are quite far away from the line. This seems to be because the points seem to becoming more curved from 1V onwards. This might be because of the temperature of the lead causing it to curve or may be simply a characteristic of a pencil lead.